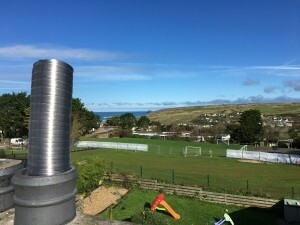 This type of flue system is a safe and cost effective way of using the existing flue. A stainless steel flexible flue liner will be used within your existing flue to “re-line” it. 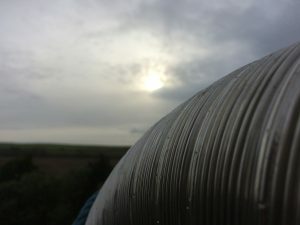 Re-lining the flue with a new flue liner has many benefits. Click here to find out what these are. There are many manufacturers of these flexible flue liners. Each one produces two types of liner. One type is used if you intend to burn wood (only permitted on a wood burning stove). The other type is used is you intend to burn wood and smokeless fuel – referred to as multi-fuel (permitted on a multi-fuel stove). The two types of liner are classified by the grade of stainless steel used – either 316L or 904L. The 904L liner is more expensive as is has a higher heat resistance to withstand the smokeless fuel. If you want to know more about the fuels of wood V’s multi-fuel click here. 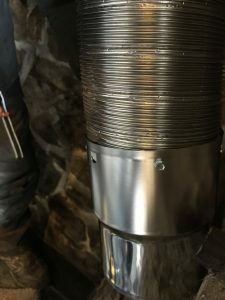 The flexible flue liners are cylindrical in shape, and are typically 5” or 6” in diameter, which will either match or closely resemble the stove’s outlet that in turn improves the stoves performance. The liners line the full length of the chimney in one continuous piece. They attach to the cowl at the top, and the adapter at the bottom. The liners are considered flexible as they resemble a large “slinky” and can be bent to bypass obstructions in your existing flue. Chimneys maybe straight, but the flues that make up the chimney have bends and diagonal runs in them. How chimneys are built varies lots too. 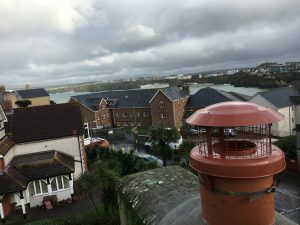 Often there are obstacles within the run of the flue – stones, bricks and dislodged clay liners – that have been subject to the abuse of previous fires and often misuse over the years. Sweeping a flue can easily dislodge a brick whose mortar has failed because of the corrosive by products of burning fuel. You’ll be surprised how often we come across this! 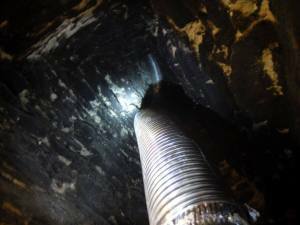 The state of an existing flue can often be in a very bad way. 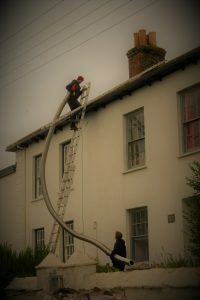 If a flue is blocked, the obstruction must be cleared if the installation is to proceed. More often than not, this results in breaking into the flue, clearing the flue and then making good afterwards. As this is an unforeseen circumstance, it is considered chargeable within the industry. However if it does not disrupt the installation and we are able to achieve our goal of completing within the day allotted, we rarely charge for this service. The actual quality of the flexible flue liners varies significantly. There are many brands available. They can be manufactured in different ways and some are more durable than others. We consider some of these to be cheap and poorly constructed as they can tear dent and unravel easily. We have literally seen brand new liners unravel. We have also removed many poor quality liners that have been damaged from poor use and even from being swept! This is a liner we removed as it was of poor quality and was not fit for purpose. We replaced it with a Duraflue liner. 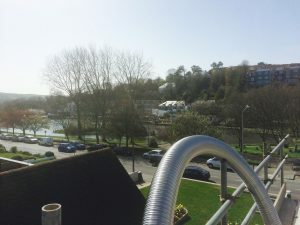 We only ever use Duraflue liners as we consider these to be constructed in the best way possible, ensuring that they are the toughest and most durable liners available in the industry. They endure the rigors of installation and continue to endure the rigors of use providing you look after them, get them swept regularly and burn the correct fuels in the correct way. The conditional warranty that comes with Duraflue liners is a testament to their quality as they are the longest available in the industry. Click here for a youtube video on just how tough these liners are! Once installed, we like to walk away knowing that our products are doing their job. 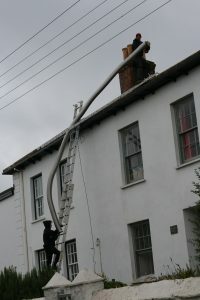 We tend to start by sweeping the existing flue to clear the passage of debris. 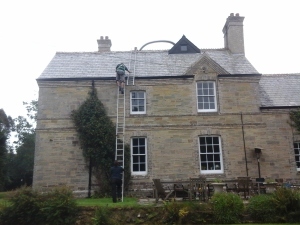 Our ladders will be set up to access the top of the chimney. The liner will be installed (from the top) using a weight and rope that is attached to the liner. The adapter is securely fitted to the liner. If a new chimney pot needs flaunching, this is done. The same applies to through wall ventilation. Follow this link for more information. We regularly have to adjust the liner up and down so we often have to go up and down the ladders several times throughout the day. 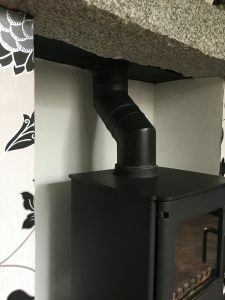 If a freestanding stove is installed, we will connect the stove to the adapter using black vitreous enamel flue pipe. Consequently, your entire flue system is sealed from the collar/spigot of the stove at the bottom, to the cowl and pot at the top. This is very effective at being safe and efficient. The stove will be “mock” installed into the fireplace and the vitreous flue pipe will need working out to ascertain what and how much is required to ensure the flue is fitting correctly and the stove is positioned in it’s optimum position so that air can flow around the entirety of the stove. A freestanding stove should never be “squashed” into a fireplace. It needs to breathe so that it can work properly! A “closure plate” will be measured and fitted above the opening of the fireplace. It closes off the chimney and flexi flue from the stove and flue pipe. This has similarities to a “register plate” but is different. It acts as a posh dustsheet (preventing any chimney debris falling onto your lovely stove). To prevent heat escaping up the chimney. We use steel to form this plate and cut it on site, as every opening is different. We cut a hole in this steel plate so that the vitreous pipe can pass through it. We make sure the plate is snug fitting and looks good, and so to finish it off we paint it black. We regularly see other closure plates that we think are sub-standard! In some instances, the flue may need insulating. This is recommended when the flue liner has lots of space around it. 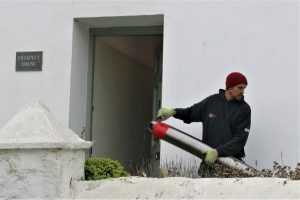 Insulating the flue will maintain the heat within the flue and thus will aid all by products and composites of combustion to be expelled from your flue. The hot air will stay hot throughout the flue, and because hot air rises, it will carry all these harmful products until they are expelled from the terminal. 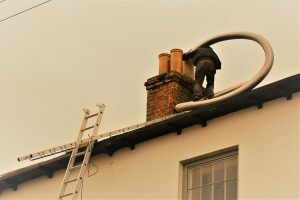 Otherwise the flue may get too cold and these harmful and tarring products may congregate within the flue, which in turn could lead to problems and dangers such as blockages and chimney fires. We will be able to advise you if your flue will need insulating. Follow this link on insulation to find out more. The order in which all these components come together will be dictated by various aspects of the installation, and often by the conditions presented outside! We have the experience gained from hundreds of installations that help make our installations as efficient as possible, saving you from any unnecessary mess and inconvenience. We have regularly been called in to pick up pieces from other professionals (including fellow HETAS installers) and DIY enthusiasts. People that have performed haphazard and dangerous stove installations, and that have taken much longer time than is required, or have encountered obstacles and problems that they cannot overcome. 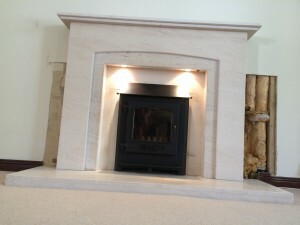 Above: An inset stove fitted with a marble hearth & surround Right: A free standing stove, hearth, rendered internal fireplace, marble surround. 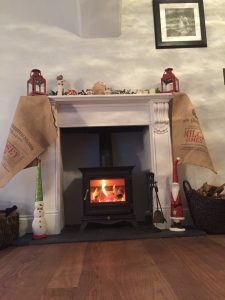 If you want a stove installation that will look and perform great, and that will be installed in a meticulous, safe and effective manner, contact Blazing Burners here.